What is it? Photo storage and sharing site which is a good solution for anyone using Apple’s soon-to-be-closed MobileMe. How is it of use to journalists? This week’s tool is one for photographers, particularly those who have been using Apple’s MobileMe. MobileMe allows photographers to store photos, password protect them and allow client’s access to particular sets. Users can then invite a client to download the entire high-resolution photo set or a single image. MobileMe is no longer accepting new subscribers and in June will close all galleries. ZangZing allows MobileMe users to save and move their galleries before they are wiped and has many of the features available in MobileMe. In addition to being able to add photos from MobileMe, ZangZing allows you to import from sites including Flickr, Dropbox and Instagram. 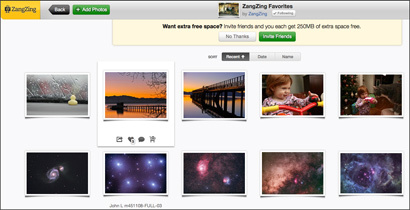 ZangZing does have an option to make a photo or gallery private but it requires anyone who wants to download the images to sign up for a ZangZing account. This entry was posted in Photography, Tool of the Week and tagged mobileme, photographs, zangzing on March 6, 2012 by Sarah Marshall.